The comprehensive encyclopedia on the life and message of William Branham. Who is William Marrion Branham? In the late 1940's, his healing ministry skyrocketed him from a pastor in a small church outside Louisville, Kentucky to an international evangelist. 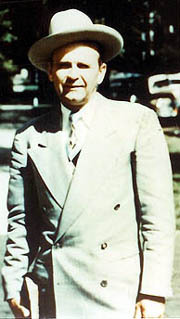 However, as his ministry progressed his visions and doctrine became increasingly controversial until his death on December 24, 1965. The purpose of this website is to provide independent, objective, comprehensive information on William Branham and to ask questions about the facts that we have discovered. At one time this website was not objective in our approach and for that we humbly apologize to our readers. Click on the links below to go to our detailed articles on a variety of subjects related to his life and ministry, his claims, the beliefs of his followers, and the criticisms of his detractors. In the first book, O Theophilus, I have dealt with all that Jesus began to do and teach, until the day when he was taken up, after he had given commands through the Holy Spirit to the apostles whom he had chosen. He presented himself alive to them after his suffering by many proofs, appearing to them during forty days and speaking about the kingdom of God. We believe that all of the evidence presented on this website is trustworthy. However, we have tried to provide all of the necessary footnotes and references from where we obtained this evidence so that you, our readers, can confirm it independently on your own. Look at the evidence, verify it, and try to answer the questions that we have raised. To the best of our knowledge, all of the information on this website is factual. If you think any of the evidence contained on this website is inaccurate, please try and disprove it. We will immediately post any evidence that conflicts with our research and correct the article on this website, provided that we can independently confirm the accuracy of that evidence. William Branham claimed to have prophecied in 1956 that Billy Graham would cancel his meetings and that this would mark the end of the revival in the United States. What did William Branham actually say? Did Billy Graham cancel any meetings in 1956? Examine the evidence for yourself and draw your own conclusions. Was William Branham a prophet? Did William Branham travel around the world seven times? What did William Branham think of himself? Video: Was William Branham credible? Were thousands healed in William Branham's ministry? Did Kenneth Hagin prophecy William Branham's death? Did any of William Branham's visions fail? Did William Branham make ANY "before the fact" prophecies? What were William Branham's significant prophecies? What is the true test of a Prophet? Videos: Did these visions of Willliam Braham fail? When did William Branham embrace Pentecostalism? Who was the man from Windsor? Why did William Branham fail to discern sexual abuse among his friends and associates? What were his major doctrines? Were any of his doctrines non-Biblical? What was the underlying theology of William Branham? Do we need a modern day prophet? The "Message of the Hour"
What is the theology of the message? Was William Branham a legalist? Are believers in the message united? What is the fruit of the Message? Only Believe? Is faith opposed to reasoning? Why do sincere Christians leave the message? What does it mean to leave the message? We pray that the contents of this website would speak to your soul, and lead you closer to Jesus Christ. Have you heard the OFF THE SHELF podcast?? When a follower of William Branham's message has a difficult question, particularly where William Branham and the Bible appear to be in disagreement, it is common to hear message ministers advise them to put it "on the shelf". Why are people continuing to leave the message in unprecedented number? Come listen to interviews with former message ministers such as Jeff Jenkins and James Rozak, as well as the authors of websites such as searchingforvindication.com, as they tell their stories of why they could not continue to follow the message of William Branham. 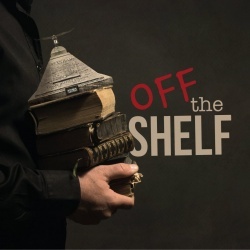 The Off The Shelf podcast is about taking important scriptural issues "off the shelf" and examining what it means to be a true follower of Jesus in the context of scripture and the message of William Branham. ↑ The Holy Bible: English Standard Version (Wheaton: Standard Bible Society, 2016), Lk 1:1–5. ↑ The Holy Bible: English Standard Version (Wheaton: Standard Bible Society, 2016), Ac 1:1–3. This page was last edited on 22 January 2019, at 22:41.